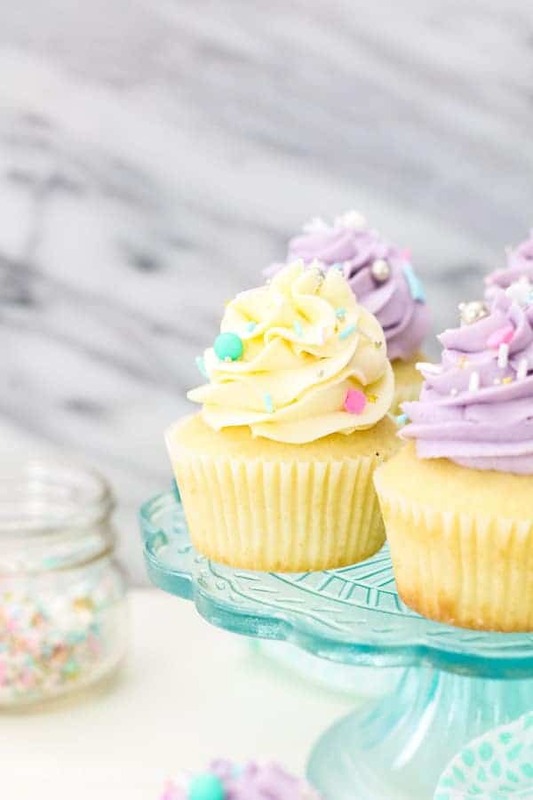 Swiss Meringue Buttercream is a silky, elegant frosting for cakes and cupcakes made with whipped egg whites, sugar and butter. It’s can be flavored with any variety of extracts and it’s perfect for piping. 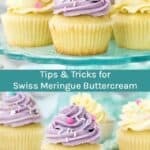 Lots of tips and tricks to learn how to make Swiss Meringue Buttercream. I first created this post in the VERY early days of my blog after I had first tried it from Martha Stewart’s cupcake cookbook. It quickly because one of my favorite frostings, but the cookbook lacked a lot of information for those who were making it for the first time. Over the years I’ve made a lot of variations of this buttercream and I want you to be successful when you make this for the first time to! I know It can be intimidating to make at first, but once you have the process down, it’s can be quite easy. The one thing that you need to account for is time. The egg white and butter should be at room temperature. The butter should be soft but not melting. You’ll also be beating the frosting for over 10 minutes, so just plan accordingly. Swiss meringue buttercream (SMB) is a light, silky and buttery alternative to traditional buttercream. 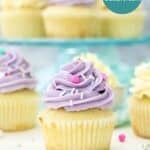 It is much less sweet, and therefore allows for the true flavors in the cupcake to shine. Although it seems like this takes more preparation than other types of frosting, the end results are very rewarding. It is easy to pipe and holds its shape very well. It’s also very easy to flavor a Swiss meringue buttercream. For vanilla, I prefer to use vanilla bean extract, but a high-quality vanilla extract works wonders. You can easily use almond, lemon, peppermint or any other extract. It even works for maple buttercream. I also love to add pureed fruit. I’ve made a strawberry Swiss meringue buttercream several times, but most recently for my Strawberry Margarita Cake. I’ve also made a blackberry buttercream as well. You can add lemon zest to make a lemon Swiss Meringue buttercream or orange zest for a Mimosa cake. • The egg white and butter need to be at room temperature before you begin, so plan accordingly. • Use lemon juice or vinegar to wipe off all utensils and bowls to remove any lingering oil and grease. • Make sure you use just enough water to cover the bottom of your pot, I suggest about 1 ¼ cups for a medium-sized pot. You do not want your bowl to touch the boiling water. • Place the pot over medium heat and do not preboil the water. If you heat the egg whites too fast, they will cook, and you have to start over. • Place a heatproof bowl over the pot of water then add the sugar and the egg whites and immediately start whisking to prevent the eggs from cooking. • Heat the eggs and sugar to 160°F. Make sure you constantly stirring or whisking the egg whites and sugar. • To see if you’re sugar is fully dissolved, you can drizzle some of the egg whites in your fingers and rub them together, it should be completely smooth. • Beat for another 5 minutes. At this point, your frosting should have turned white and the body of the meringue starts to form. Increase the mixing speed to high. It will start to look glossy as the peaks begin to form. Beat for another 3-5 minutes until the bottom of your bowl is cool to the touch and your meringue has stiff peaks like marshmallow. • Turn your mixer down to medium-low. Slowly add your butter, 1 tbsp at a time. As you add more butter, the frosting might appear to have curdled and lost its body, that’s ok. Scrape down the sides of the bowl. 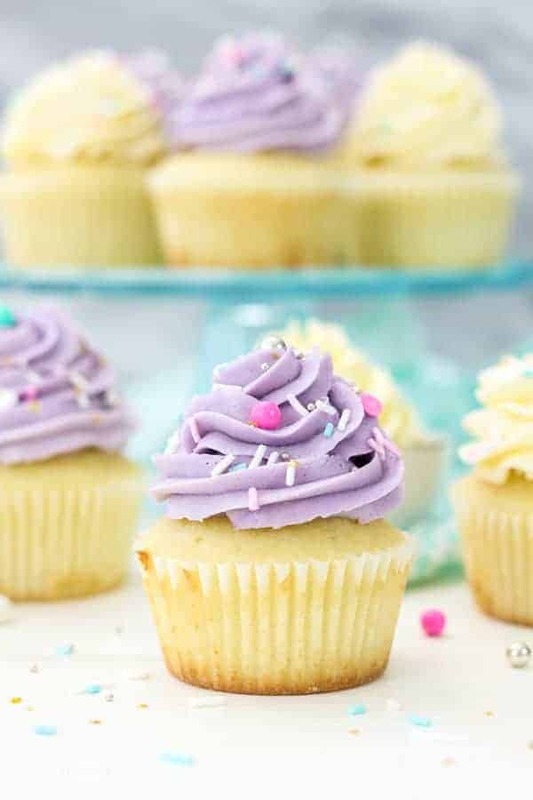 • Switch to the paddle attachment, add the vanilla extract and continue beating on medium-high speed until your frosting start to have stiff peaks. Beat for about 3-5 minutes. The utensils have to be grease-free, so I use only metal utensils. If you must use rubber, make sure they are only for meringue. I have rubber spatulas which I only use when I have meringue base frosting like royal icing. Use a candy thermometer, I bought mine at target for $10 and it has been well worth the investment. 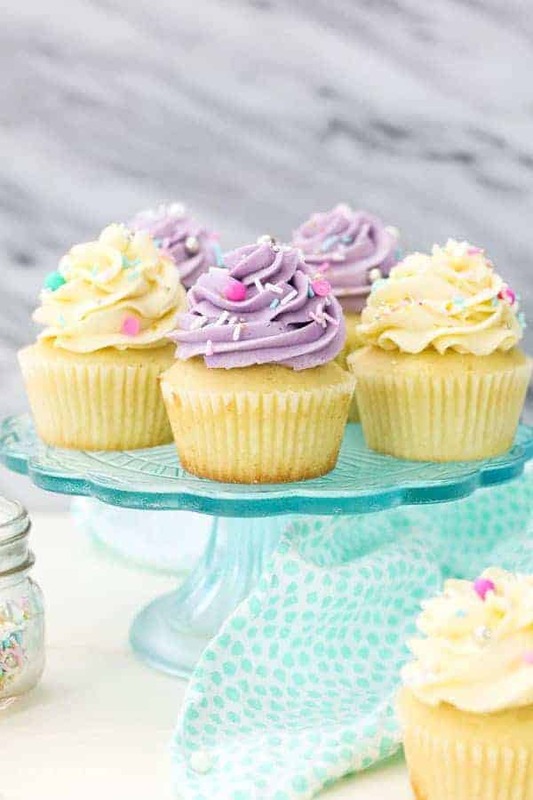 To keep your SMB a crisp bright white, use colorless imitation vanilla extract, which can be purchased at a craft store or specialty cake store.• Make sure your butter is at room temperature before adding it to your frosting. If your butter is too cold, it will not mix well and you will end up with chunks of butter in your frosting. Always use unsalted butter! This allows you to control how much salted is in your frosting. I once made the mistake of using salted butter and the frosting was WAY to salty, I think I ended up throwing it out and starting over. 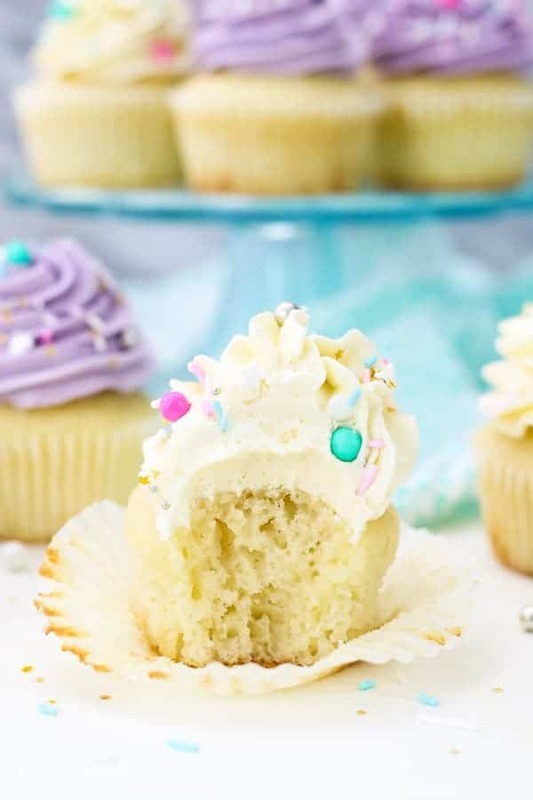 Do I need to put my cake/cupcakes in the fridge after they’ve been frosted? I do not refrigerate my cupcakes or cakes after frosting them. Due to the high ratio of butter, this frosting will harden. 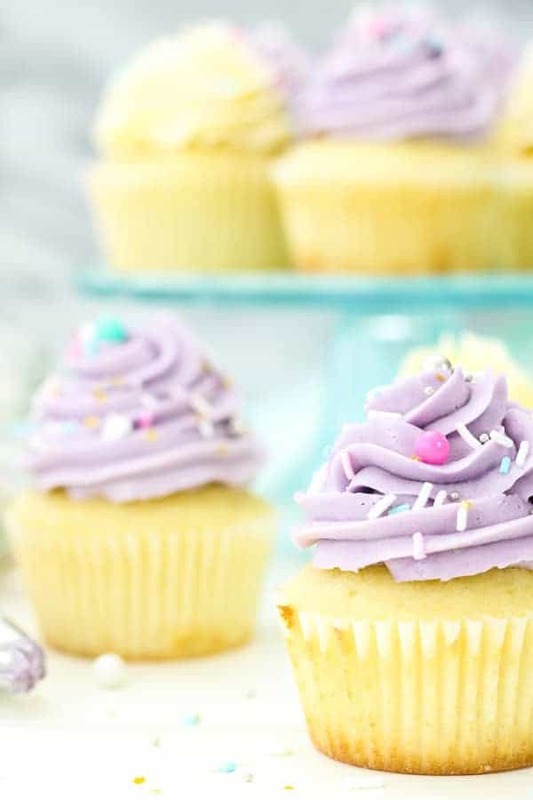 If you do refrigerate the cake or cupcakes, then it will need time to come back to room temperature before serving. Can I make this frosting in advance? I make and frost my cakes and cupcakes right away, and I store leftover frosting in an airtight container on the counter top overnight. However, I’ve read that Swiss Meringue Buttercream can be made in advance and kept in the refrigerator for up to 7 days and beyond that it should be frozen. I have not froze this buttercream myself. Regardless if you put this frosting in the refrigerator or freezer, it will need to come back to room temperature prior to using, and you may need to rewhip it with the paddle attachment of your stand mixer. My frosting looks curdled or runny, how to I fixed it? During the process of adding the butter, the egg whites lose all the air, and the gorgeous white meringue turns to a soupy curdled more liquid-like consistency. Don’t worry! We aren’t finished yet. Once all the butter has been added and mostly incorporated, change to the paddle attachment and start to whip the buttercream. After a couple minutes you’ll notice the curdled frosting start to stiffen and just like magic, your Swiss Meringue Buttercream comes together. It has never happened to me, but I have read that if your frosting is still soupy, then you can put it in the refrigerator for 15-20 minutes and then rewhip. Will this frosting melt in hot or humid environments? This frosting has a high butter content, if you live in a hot or humid environment, I do not suggest using this frosting. I’d rather recommend American buttercream such as my perfect vanilla frosting. Is this frosting good for piping? Yes! 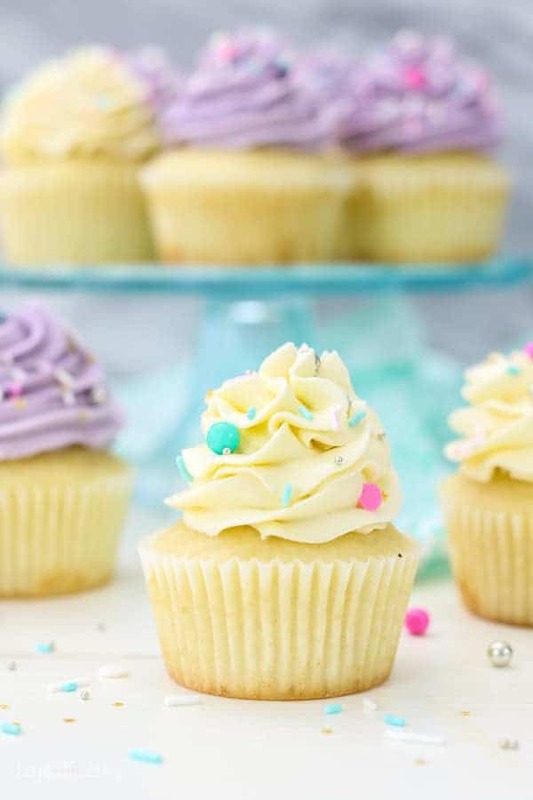 Due to the very light and airy texture of this frosting, it is great for piping! However it is a softer frosting, so I would expect it to “settle” a bit. Can I use this to make a layer cake? Yes! It works great for layer cake, but you’ll need to increase the amount of frosting you’re making. For a 3 layer 8-inch cake, I use 10 large egg white, 3 cups of unsalted butter and 2 1/2 cups of granulated sugar plus your extract. 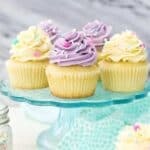 I sure hope that you’ll give this frosting recipe a try! It’s quite different and far less sweet than traditional American buttercream and it pairs really well with cakes that have fruit! Wipe down the inside of your stainless-steel bowl with vinegar to remove any grease. 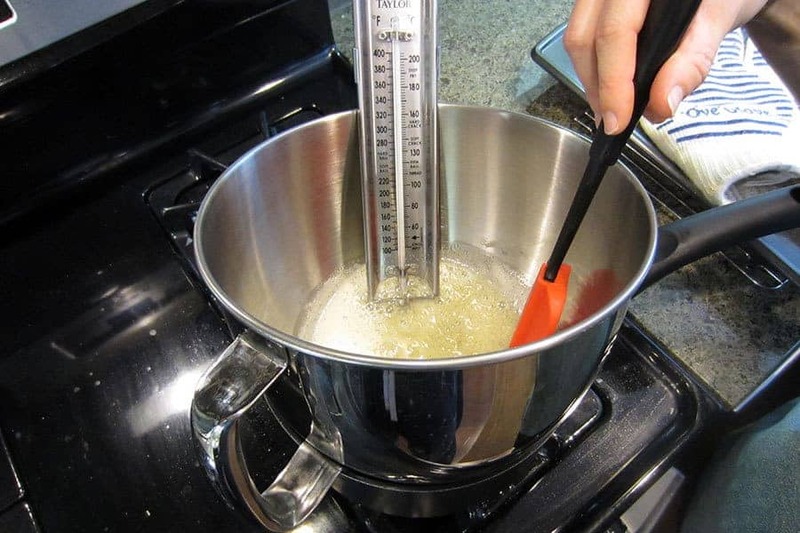 Combine sugar and egg whites in the bowl with candy thermometer attached. Beat for another 5 minutes. At this point, your frosting should have turned white and the body of the meringue starts to form. Increase the mixing speed to high. It will start to look glossy as the peaks begin to form. Beat for another 3-5 minutes until the bottom of your bowl is cool to the touch and your meringue has stiff peaks. Switch to the paddle attachment, add the vanilla extract and continue beating on medium-high speed until your frosting start to have stiff peaks. Beat for about 3-5 minutes. To tint the buttercream, slowly add the color gel and beat with paddle attachment or fold in with a spatula until completely incorporated. This can easily be flavored with any type of extract vanilla bean, peppermint, almond, lemon etc. Start with ½-1 teaspoon at a time. Lemon, lime or orange zest is a great way to add a more intense flavor. Coffee- Flavor with instant espresso powder together with vanilla extract, start with 1 teaspoon at a time and add for additional flavor. Melt 4-6 ounces chocolate, cool to room temperature. 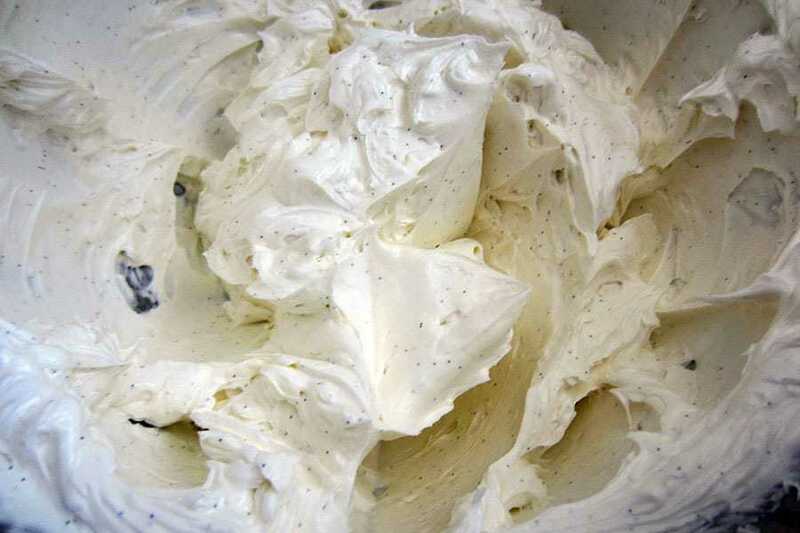 Fold into buttercream using your spatula after adding vanilla extract. I followed the recipe exactly. It came out exactly as you said. However it is quite tasteless. It’s pretty, pipes well but even adding more vanilla didn’t fix it. I’ll stick with traditional buttercream icing that my family and friends look forward to. I did wait to experiment and make this when it wasn’t humid. Hi Tracy- yes it’s far less sugary than traditional buttercream frosting, and a much more mild taste. I am so glad you tried it! I used your SMBC recipe this weekend and it was my first time. It came out awesome. It was a hit.Thank you very much for sharing it. Thank you so much Elham! I am so happy this was useful for you! If I want to use pasteurized egg whites, what would the equivalent be for 5 large egg whites? Hi Elam, sorry I am not familiar with pasteurized egg whites, I’ve only ever cracked whole eggs.